The Ecological Society of America (ESA) has responded to the growing commitment among ecologists to make their science relevant to society through a series of concerted efforts, including the Sustainable Biosphere Initiative (1991), scientific assessment of ecosystem management (1996), ESA’s vision for the future (2003), Rapid Response Teams that respond to environmental crises (2005), and the Earth Stewardship Initiative (2009). During the past 25 years, ESA launched five new journals, largely reflecting the expansion of scholarship linking ecology with broader societal issues. The goal of the Earth Stewardship Initiative is to raise awareness and to explore ways for ecologists and other scientists to contribute more effectively to the sustainability of our planet. This has occurred through four approaches: (1) articulation of the stewardship concept in ESA publications and Website, (2) selection of meeting themes and symposia, (3) engagement of ESA sections in implementing the initiative, and (4) outreach beyond ecology through collaborations and demonstration projects. Collaborations include societies and groups of Earth and social scientists, practitioners and policy makers, religious and business leaders, federal agencies, and artists and writers. 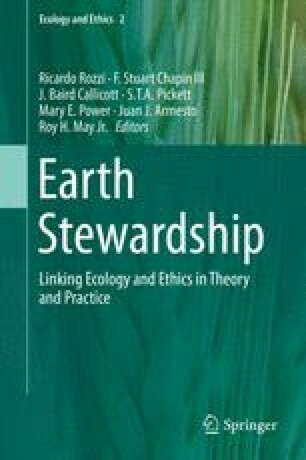 The Earth Stewardship Initiative is a work in progress, so next steps likely include continued nurturing of these emerging collaborations, advancing the development of sustainability and stewardship theory, improving communication of stewardship science, and identifying opportunities for scientists and civil society to take actions that move the Earth toward a more sustainable trajectory. We thank the staff, governing board, and members of the Ecological Society of America, especially Executive Director Katherine McCarter, for their engagement in crafting and implementing ESA’s Earth Stewardship Initiative. We also thank Baird Callicott, Cliff Duke, Katherine McCarter, and Teresa Mourad for their careful review of this chapter.